The first artist-driven dark ride the world has ever seen, opening April, 2019. A mind-blowing riff on Shakespeare's classic tragedy Macbeth as seen through a darkly cinematic lens, the immersive theater experience Sleep No More continues to dazzle and unnerve audiences nightly at Chelsea's McKittrick Hotel, where it has been packing in curious and adventurous theatergoers since Spring 2011. Masked patrons move freely through nearly one-hundred individually designed spaces, each meticulously designed, as the story unfolds around them in a stirring mixture of movement, sound, and visual poetry. A 10+ year series of burlesque variety shows and original narrative theatre pieces utilizing all live music and a core ensemble of 7 performers as well as headlining guest talent. Over 200 unique shows produced over the course of 10 years in more than 20 U.S. cities. In this fully immersive, multisensory theatrical experience, audience members embark upon an individual journey through a dream-like world, passing through a sequence of intimate and powerful phantasmagoric one-on-ones. A haunting and compassionate reflection upon the Mexican folk legend of La Llorona ("the weeping woman"), created, produced and performed by numerous alumni of the U.S. production of Punchdrunk's Sleep No More, including Obie Award-winning designer David Israel Reynoso (Llorona's Creator and Co-Director), Careena Melia (Co-Director), Jenny Weinbloom (Producer), Kelly Bartnik (Performer), and Robert Najarian (Performer). etherhouse explores the contemporary culture of grief through innovative interactive technology deployed in an immersive theatrical physical environment. As we traverse and explore the physical story space, the digital story space responds and evolves. The story elements available in the digital realm relate to those in the physical environment. These elements explore the arc, ritual, behavior, and culture of grief in point and counterpoint. This video is a demonstration of the location responsive technology in development for etherhouse, first demonstrating a social media feed that auto-populates in response to a user's physical location and then demonstrating location responsive projection mapping. Guests received an invitation with a hidden phone number urging them to call. When they called, they heard a message in Russian underscored by Stravinsky's Rite of Spring and a single phrase invoked in English: "consume everything." They later received a call back from the same mysterious Russian woman with a date and address where they would meet at a warehouse in downtown Los Angeles. When they arrived at the unmarked warehouse and knocked on the door, Rasputin answered and invited them inside where a fairytale babushka poured them tea from a samovar and sang them Russian lullabies before sending them to a stone-faced border agent wearing silk robes and a ushanka who presented them with a fantasy map of the neighborhood and sent them on their way. 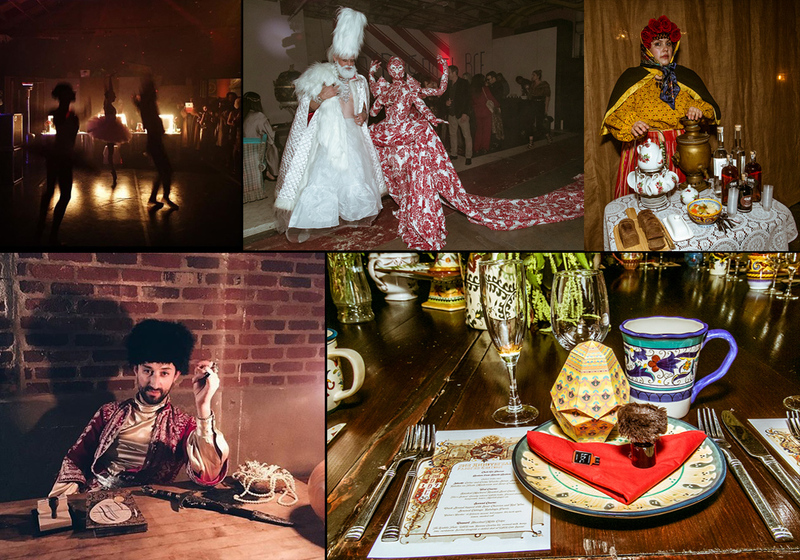 They then followed the map along the river, meeting a Russian Orthodox priest swinging frankincense and intoning in Russian, the witch Baba Yaga, and other characters from slavic history and folklore along the way, before arriving at another warehouse, decked out in Russian splendor for a night of dining, dancing, and decadence in an immersive theatrical world based on Stravinsky and Tchaikovsky, featuring a fully staged ballet performance inspired by the Ballets Russes. The first ever comic con on a cruise ship, presented over four days on Royal Caribbean’s Brilliance of the Seas. Featuring panels, workshops, performances, and appearances by the casts of Stranger Things, The Walking Dead and Guardians of the Galaxy as well as comic book writers and artists including Frank Miller. The 2014 holiday windows for Barneys New York, under the artistic direction of Baz Luhrmann, marked the brand’s first experience crafting a large-scale theatrical event that would live for six weeks inside their windows with daily performances featuring an ice skater, a pair of break dancing elves, and two opera singing queens performing Madonna in lavish gowns by Zaldy and Catherine Martin. The unveiling of the windows was marked by an outdoor performance spectacular that took over all of Madison Avenue, featuring a live performance by Pentatonix plus fifty ice skaters, drummers, dancers, actors, and musicians, performing under the direction of Baz Luhrmann and choreographer Jermaine Browne. Daily Mail: Talking Owls, Ice Dancers and Contortionist Elves, Oh My! Following the unveiling of the 2014 Barneys New York holiday windows, celebrity guests including Anna Wintour and Dakota Fanning followed a military marching band from the store to the Central Park Zoo, where they were greeted by beautiful stilt walkers dressed as trees who danced around the sea lion pool. Inside, guests were served champagne by stilted snow queens and swept away into a secret snow globe speakeasy to sample hand-shaved boozy snow cones and to receive an intimate one-on-one performance by our opera singing Queens. Guests were later ushered into a lavish dinner where the a cappella group Pentatonix broke out into a “spontaneous” musical performance on top of one of the tables. Dinner was followed by dancing and ice luge vodka shots from a live-carved ice sculpture of a buxom elf. Guests arrived at the former Williamsburg Savings Bank to find it transformed into a contemporary take on a classic Havana nightclub. Guests enjoyed signature Bacardi cocktails and hand-rolled Cuban cigars as well as explosive performances by Yerba Buena, Twin Shadow, and our headliner, Future. Event marked the debut of the new venue, Weylin B. Seymour’s, housed in the former Williamsburg Savings Bank. The entire event was livestreamed on the Bacardi YouTube masthead where viewers at home joined over 1000 live guests in experiencing the show. A Williamsburg warehouse was transformed into a dreamy wonderland to celebrate the release of Magic Hat's newest brew. Upon arrival, guests passed through a rainbow-colored waterfall of fog before arriving into a psychedelic dreamscape where aerialists dangled from the ceiling and renowned visionary painter, Alex Grey, worked on a 32' x 8' mural that covered the walls of the venue, and DJs Wolf + Lamb played through the night. Event premiered Magic Hat's new Dream Machine van--a glow-in-the-dark Scooby Doo-like hippie van that doubles as a gif-generating photo booth and a mobile tap on wheels. Motorcycle journalists met at the Bear Mountain Inn where, following a breakfast and presentation, they were each given a route map, gear, and a Continental GT café racer to test drive for the afternoon. Guests sped through the beautiful lower Hudson Valley on their borrowed racers before being shuttled back to Brooklyn where they joined influencers from the motorcycle and media industries to toast Royal Enfield at an intimate cocktail party in Williamsburg. Guests enjoyed signature cocktails, intimate interaction with the bikes, and music inspired by the mod aesthetic of the café racer, celebrating the longevity of the Royal Enfield brand as well as the innovation of their new signature design. Star-studded salon event for New York Fashion Week. Celebrities including Carmen Electra, Rosario Dawson, Jenny McCarthy, and Michelle Williams descended upon Salon SCK in Columbus Circle to receive a series of complimentary beauty services prior the night’s Fashion Week festivities, including Jamberry manicures, Panasonic Beauty tool blowouts by celebrity stylist Cesar Ramirez, and custom jewelry fittings by Uno de 50, all while enjoying passed appetizers and cocktails provided by sponsors from Yellowtail, Skinny Girl, and Arizona. Guests arrived to find an artfully trashed venue, atmosphere performers as the typical "last call" crowd, and a party already over, waiting to be reborn. The event celebrated the ongoing legacy of AREA, "the nightclub-as-art-gallery that came to define the creative hedonism of 1980s New York" (NY Times). The concept was a whimsical response to the sense we've all had as contemporary New Yorkers that we missed the party, so to speak, by arriving in New York in the 2000s, and an opportunity to celebrate the immortality of New York nightlife. An immersive installation for Red Bull in Washington DC intended for only one guest--celebrity golfer, Rickie Fowler. We transformed a decrepit parking garage into a projection mapped fantasy land with moving islands, sea monsters, and a talking man in the moon all to challenge Rickie and prepare him for the tournament ahead. An intimate nightlife party inspired by Storyville, New Orleans' turn of the century red light district. We had two gritty jazz bands performing, one inside the venue and one outside on the street, as well as atmosphere performers in turn of the century lingerie, burlesque dancers, and a masterful sidewalk cigar roller, leaving guests feeling as if they'd been transported through time. Les Salonnieres presents "A Midsummer Night's Magic"
Guests traveled to a mysterious lower east side location where they were each given a hand drawn fantasy map and a picnic basket. They followed the map to a secluded park beneath the Brooklyn Bridge, meeting Shakespeare’s quartet of lovers along the way before descending into fairy land. In the park, guests witnessed performances by Barefoot Shakespeare, danced to an 11-piece jazz band, created their own interpretation of Shakespeare’s “Rude Mechanicals” with the help of professional mischief makers HiChristina, and dined beneath the stars under the flavor tripping influence of miracle berries. A theatrical dining experience inspired by El Dia De Los Muertos and the seven deadly sins. 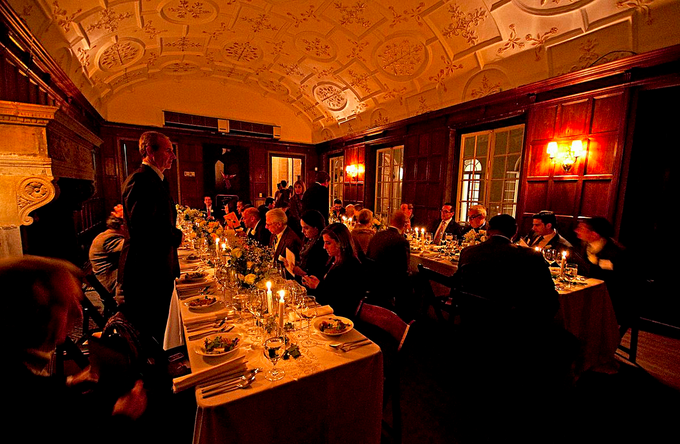 Guests received a mysterious phone call leading them down an alternate reality rabbit hole, instigating a series of phone, email, and event-based lead-up experiences prior to the event itself--a dinner with the dead. Music, burlesque, and fetish performances followed the gluttonous feast as the damned tempted the living to indulge in their sins. An elegant tasting event for Montes Wines at a 1920s mansion, preceded by a whimsical, performance-driven, map point journey through Central Park. A unique marriage of the excitement of experiential multi-point adventure and the elegance of a vertical tasting. Baroque dance ensemble, Company XIV, headlined this event. The night culminated in a three course feast accompanied by charmingly scratchy recordings played on a vintage, hand-cranked victrola. A consumer event to celebrate the 25th anniversary of Wine Enthusiast Magazine that brought to life La Belle Epoque in a resplendent carnival setting. Over 36 wine producers poured some of the best wines in the world (all 90 points or above) as a 12-piece jazz orchestra played an an aerialist perched upon an illuminated crescent moon dropped origamied love notes to her admirers below, all in a Parisian street scene decorated with whimsical carnival tents and beautiful water-colored lanterns. An industry launch event celebrating the 30th annual release of Beaujolais Nouveau. A once familiar venue was transformed into a French provincial village at harvest festival, with stilted wine servers, roaming storytellers, palm readers, spectacular stage performances, and the climactic reveal of the 2012 Beaujolais Nouveau in a curated augmented reality performance by techno-illusionist, Marco Tempest. Brooklyn-based record label representing Amanda Lepore, Cazwell, Chris Willis, The Ones, Ultra Naté, and more. Arranged international performance bookings and travel arrangements for queer nightlife artists, Amanda Lepore and Cazwell. Performed all fee negotiation, contracting, invoicing, travel booking, and tour management for bookings in Russia, Germany, Indonesia, Japan, Mexico, Brazil, Taiwan, France, Sweden, Canada, Spain, and the U.K. and traveled internationally alongside artists. Also maintained all itineraries, records of payment, mailing lists, press kits, and social media for artists. An alternate reality game that wove through web and real-life, engaging fans in international collaboration via social media as well as at live theatrical game events in New York, Boston, and London. More than 1000 players participated on 3 continents for over 2 weeks. The game culminated in the opening night of the New York production of Sleep No More. An original burlesque musical comedy based on the classic '90s cartoon Animaniacs, featuring all live music and a 19-person cast. The show premiered in a sold-out three-week run in NYC in 2012, culminating in a guest performance during NY Comic Con by legendary voice actor Rob Paulsen, who created the characters of Yakko, Pinky, and Dr. Scratch'n'Sniff on the original cartoon. The show has been seen in New York, Boston, and Minneapolis. Annual film festival based at Village East Cinema introducing the best of contemporary Russian film to U.S. audiences.